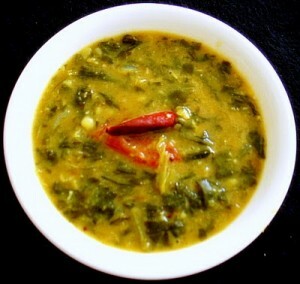 Daal Saag (Moong Daal And Spinach) recipe by maham at DesiRecipes.com. Pre-cook the lentils using three cups of water. Heat oil in a saucepan and fry the cumin seeds for a minute. Add the sliced onions, minced ginger , minced garlic , cumin, coriander and garam masala powders, as well as spinach and sliced tomatoes and cook stirring constantly for ten minutes on medium low heat. Stir in lentils with another three cups of water and turmeric powder. Heat till the mixture starts boiling, season with salt and lemon juice and turn off the heat. How many cups of lentils are used in this receipe? Thanks! This recipe came out delicious . I added red chili powder to make it spicy.